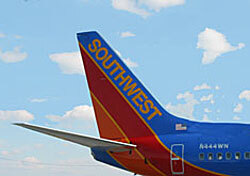 Southwest confirmed a few weeks ago that it will add bigger versions of the Boeing 737 to its existing all-737 fleet. Even up to that point, the question was largely when, not if, the airline would make a move to order the larger aircraft. Yesterday, the carrier re-confirmed the decision, saying it has 20 “firm” orders for the -800, to be delivered beginning in March 2012. Southwest said it switched existing orders for the smaller -700 model; the -800s will feature Boeing’s Sky Interior, which offers a quieter cabin, more overhead bin space, and LED reading and ceiling lighting. But perhaps the most interesting part of Southwest’s announcement is this: “The current plan is to deliver these … aircraft in full Extended-range Twin-engine Operational Performance Standards (ETOPS) configuration.” What, exactly, does ETOPS configuration mean? “ETOPS,” the Dallas Morning News‘ Terry Maxon wrote Monday, “[means] the ability to fly over the water long distances with aircraft that have two engines, like the Boeing 737.” Airlines must have approval to operate flights that take aircraft a certain distance from diversion airports. This basically requires aircraft that can cover the approved distance on one engine, and ground operations to run the program. Maxon reported that Southwest had posted a job opening for an ETOPS manager. Bottom line: You can’t fly to Hawaii without ETOPS certification. Nothing is official until it’s official, but all signs point to Southwest using the -800 to fly to Hawaii. No other ETOPS destinations leap to mind as obvious choices for an airline so far devoted to U.S. travel. Well, none that wouldn’t be wild speculation, anyway.